John Terry, the English rock, a man amongst men, a leader and England Captain. Well that’s what we all thought but pressure is a strange bed fellow and the change in this man in the last year is nothing less than dramatic. What is rattling his footballing cage? I like many others believed that when the Beckham circus left town JT was the right man to lead England, just and only just ahead of Steve Gerrard. He was a leader, the main reason why Chelsea were so hard to beat and surely the man to lift England out of their post world cup lethargy. It hasn’t quite worked out that way, to be honest in the rarified atmosphere of international football John Terry is limited. His skill level is way below Rio Ferdinand never mind the sumptious Italian and French defenders. His assumption that more shouting would somehow improve England was embarrassing and the results in our qualifying games proves that Terry’s England need more than a clenched fist. The first chinks in his armour and the first seeds of self doubt must have been sown. Chelsea have been widely criticised for their style, while Man Utd win with a flourish and real excitement. Chelsea have muddled through winning by the odd goal in the last minutes of games. Mourinhos increased mania must be flowing through to his team. Suddenly Terry is contesting every decision and is in referees faces ever more vehemently. 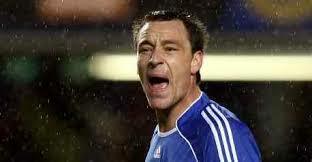 It is only a matter of time before a ref follows Graham Polls lead from earlier in the season and sends Terry off. His hysterical display when being out muscled by Antoine Sibierski in the Newcastle game at the weekend would have been funny if it wasn’t the England Captain pulling his shorts, stamping his feet and screaming like a spoilt boy. Grow up John! His arrogance in turning up at the black tie PFA Awards in an open neck shirt and a school jumper indicates that he now believes he is above the rules. Someone should have told him, maybe he should have been turned away at the door, maybe he should remember who he is, what he represents and the example he should be setting. Finally tonight after Chelsea scraped another 1-0 win in the Champions League against Liverpool he could be seen ranting at Marcus Merk the German referee over another perceived wrong doing. Merk’s dismissive wave of the hand shows that Terry’s whining has been noted by a wider audience. It was wrong, disrespectful and not how the England Captain should be conducting himself. It’s time someone took him in hand and as Mourinho would neve criticise his captain it should be Steve Maclaren who now removes the Captains armband and passes it on to Steven Gerrard. The pressure is obviously to much for Terry and maybe he needs to be saved from himself before it’s too late. If Chelsea end up losing out on the remaining three trophies they’re chasing who knows what the increasingly erratic Terry might do. He needs reminding where he came from before this particular English rocks crumbles to a pile of dust blown away by a public and media tiring of his pathetic antics.